This article first appeared in Personal Wealth, The Edge Malaysia Weekly, on July 16, 2018 - July 22, 2018. Fractional investing has taken off across the world as retail investors look for ways to diversify their portfolios and mitigate risks. Today, investors can buy a fraction of a share in a listed company or a portion of an investment scheme. Thanks to advancements in technology and the democratisation of assets, Malaysian investors can now invest fractionally in invoice-financing products for as little as RM10. According to Steven Artamonov, general manager of LendingStar Malaysia Sdn Bhd, this highly liquid investment can provide decent returns over the short term. 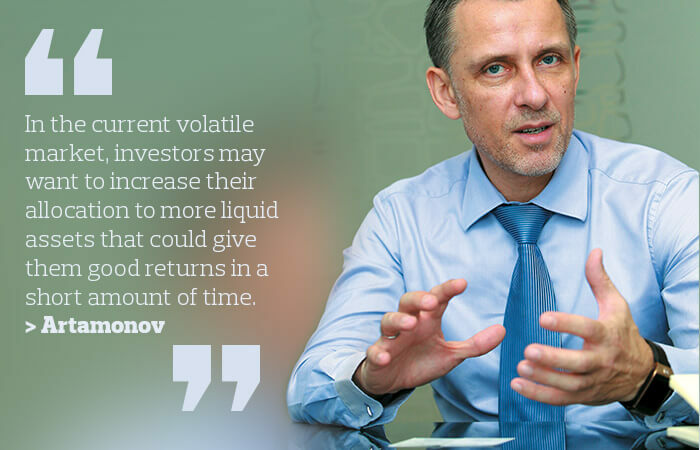 “In the current volatile market, where equity and bond markets are not giving sufficient returns, investors may want to increase their allocation to more liquid assets that could give them good returns in a short amount of time. The options, however, are limited and they are often rather risky or require a high minimum investment amount,” he says. To give investors the option to diversify across different levels of risk and returns with little capital, Artamonov has launched LendingStar — an online platform that allows businesses to trade their invoices or other accounts receivable, which is also known as invoice financing. Although the company uses the term “invoice financing”, its product is structured differently from those of peer-to-peer (P2P) lending platforms in Malaysia. While typical P2P invoice-financing products offer investors a return on interest rates, LendingStar’s investors gain from discounts offered, says Artamonov. This mechanism, which is not widely offered in the country, is a lot easier for investors to understand compared with the typical interest-rate mechanism, he adds. Essentially, small and medium enterprises (SMEs) would have to wait for months to be paid after submitting their invoices to the buyers of their products and services. By submitting their invoices to platforms such as LendingStar, the SMEs can make them available to retail and institutional investors at a discount and get paid immediately in return. “How it works is very simple. After choosing an invoice they are interested in financing, investors can make an offer to the SME, expressing their preferred rate. The SME can either accept or reject the offer. If it accepts the offer, the investment process begins, with the returns of the investors clearly stipulated in the terms and conditions,” says Artamonov. He adds that invoice financing also gives investors more certainty as accounts receivable are recorded as an asset on a company’s balance sheet. So, there is a legal obligation for the buyer to pay off the debt. In addition, accounts receivable are considered a current asset, which means the payment is due in one year or less. Also, LendingStar only accepts invoices issued to reputable buyers with a AAA corporate credit rating, such as Tenaga Nasional Bhd, Petroliam Nasional Bhd and IJM Corp Bhd. This will give investors more peace of mind. How much investors earn from such investment products largely depends on the amount they pay for the invoice. But Artamonov says investors can get a return of about 14% per annum on the platform. By comparison, an invoice-financing product offered on a local P2P platform offers a return of 8.05% to 11.9% per annum after deducting fees, according to an article published in Personal Wealth on March 26. LendingStar currently charges investors only 0.1% for every successful investment or invoice paid. However, they have to deposit a minimum of RM1,000 to start investing on the platform. The invoices available on the platform vary in size, but are usually up to RM200,000. The cap is increased to RM400,000 for returning SMEs with a positive track record. One of the lowest invoices thus far was worth RM60,000 while the highest was worth RM380,000. There is no minimum lock-in period. Uninvested funds may be withdrawn at any time and returned to the investors’ accounts. However, funds that have been used to invest in invoices cannot be redeemed until the invoice has been paid. Prior to running LendingStar, Artamonov spent more than 17 years in the IT industry, serving companies such as software developer Microsoft and consulting firm Robertson and Blums. The LendingStar platform was launched last November, but the idea for it came about in 2012. It took Artamonov’s team some time to decide on which country in Southeast Asia they would launch the platform in. They found Malaysia to be the perfect place due to the demand for the product among local SMEs. Citing SME Corp Malaysia data, Artamonov says the country currently has more than 900,000 SMEs. And about 97% of the financing for these businesses is provided by the banks compared with 50% to 65% in developed economies. That means only 3% of the financing for SMEs is provided by alternative lenders such as venture capital and private equity firms and P2P platforms. “In addition, invoice financing represents 0.8% of the financing for SMEs compared with the worldwide average of 4.5%. The opportunity for us is huge — 75% of local SMEs require small financing (RM100,000 to RM200,000) every month for purposes such as purchasing materials or developing new projects, which banks typically do not finance. That is why we believe this is the perfect market for us to start in,” says Artamonov. Invoice trading is currently not regulated by Bank Negara Malaysia or the Securities Commission Malaysia (SC). According to Artamonov, the deals that take place on the LendingStar platform are treated as true sales of accounts receivable instead of lending, as defined by the Companies Act 2016. That means the deals are part of typical sale and purchase activities — there is no credit being extended to any party on the platform. Investors are purchasing the invoices rather than financing them. Artamonov says when the SC invited applications for P2P platform operator licences in 2016, LendingStar decided to put in its application. However, due to the strict requirements of the SC and the fact that the company did not want to facilitate lending like the P2P operators did, it decided not to proceed with its application. Although Artamonov describes the investment as low risk for investors, he acknowledges that there are two huge risks associated with invoice financing, namely fraud and payment defaults. To address these, the company conducts comprehensive due diligence before allowing any SME to issue anything on the platform. “After they register, we thoroughly check the status of the company and people associated with it. This is where KYC is important. A common problem in the global industry is that some individuals behind the companies upload fake invoices and tend not to identify themselves,” says Artamonov. If the buyers are late in their payments and negotiations are unsuccessful, LendingStar will engage a professional collection agency to collect the payments. The platform already has a few hundred investors. Nevertheless, Artamonov is optimistic that more people will recognise the importance of fractionalising to diversify their portfolios. “I believe one of the reasons investors are reluctant to invest on digital platforms such as ourselves is because they think the convenience that we offer is too good to be true. We hope that next year, when we launch our mobile application and expand to other countries, we will be able to convince more investors to give it a try,” he says.